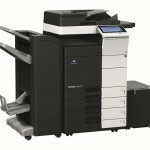 Pay For Copies Only Plan - 4.5p per colour copy! 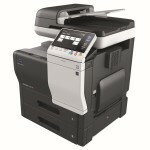 You pay only 0.6 pence per B/W copy or printout & 4.5 pence per copy per colour copy or printout. 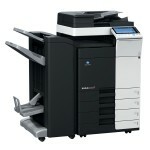 The Konica Minolta Bizhub C452 is a professional quality color printer copier that will revolutionize your workflow. 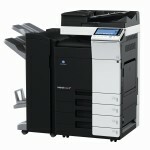 You can count on Konica Minolta to help you print, copy, scan and fax at speeds up to 45 ppm in B&W and 45 ppm in color. 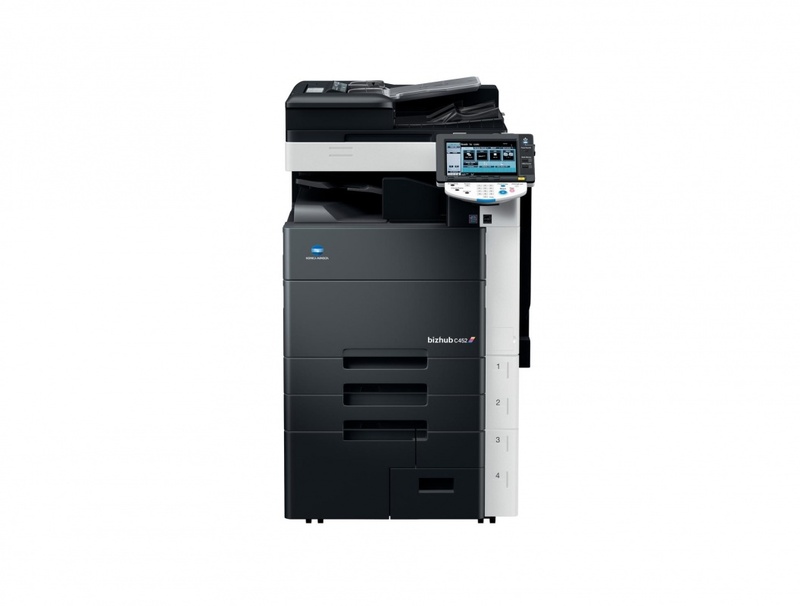 From every angle, the Konica Minolta bizhub C452 Series looks sleeker and more sophisticated than conventional printer-copiers. It features dramatic dark cabinetry with hidden cords – perfect for center-office placement. 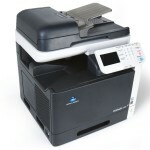 The new bizhub’s hard disk drive Box function allows users to save scan, copy, print or fax data to the Box. It also permits boxes to be assigned to individuals, project teams, departments or themes for more reliable storage (up to 3,000 documents or 10,000 pages), seamless distribution and easier sharing of knowledge. Now, the Box also includes functionality that allows users to change print and send settings for files residing in the Box?switch from colour to black & white, change resolution, enlarge/reduce and more. 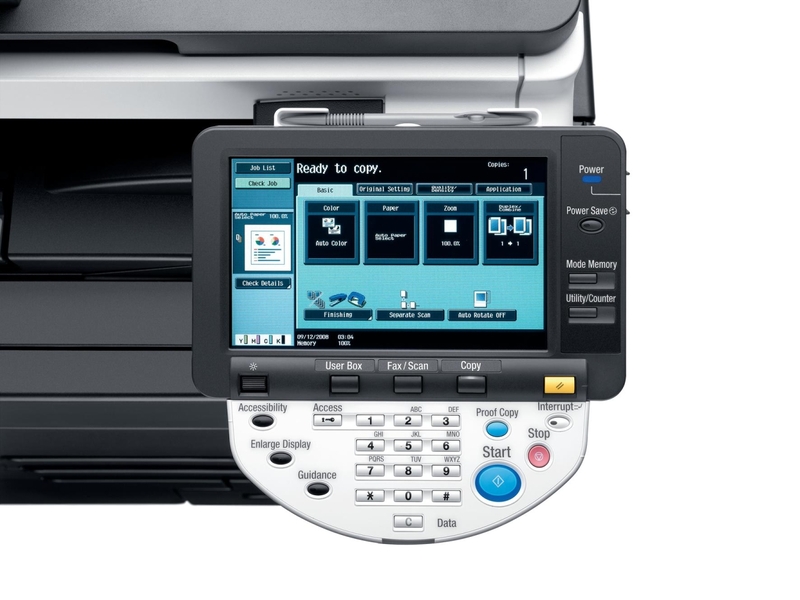 The bizhub’s standard Colour Internet Fax allows you to cost-efficiently send a colour or black & white fax to any MFP that supports the Profile C standard, even machines outside of the intranet. Because this method uses the internet, no additional costs are associated with it. Select your i-Option functions based on your individual usage needs and environment. i-Option helps you enhance your bizhub’s capabilities by offering greater convenience and customisation. Utilise the bizhub’s control panel as a general purpose Web browser* that enables PDF files to be previewed, downloaded and printed without a PC. The Image Panel function* divides the control panel into three areas?input, edit and output and allows each to be customised based on your needs, thus improving your workflow. Scanning to yourself is now easier than ever with Scan to Me. If user authentication is set, selecting the”Me”one-touch key in the address book allows scan data to be sent to the user’s own e-mail address. Use the Scan to Home feature to send the data to a registered PC. These simple but useful security features allow administrators to limit or disable any scan and send traffic outside of these ranges, effectively restricting where scans can be sent. Our new log management features help you better manage usage and costs for your office’s new bizhub. The log has been expanded to allow logs to be compiled for counts and accounts, as well as the existing capability for audits. This means that the bizhub doesn’t just record which users have performed which jobs. It also records paper size, number of copies made and other useful cost and resource management information. Perfect for individual user authentication, IC cards allow your organisation to restrict copy, print, scan and fax functions. For the new bizhub, a function has been added that allows LEGIC*, MIFARE* and FeliCa* (SSFC Format / FCF Format) cards to be used to access data in high-security areas, making it possible to perform high-level, multi-functional authentication management, such as synched operation with room entry and exit management. Working in conjunction with finger-vein and IC card authentication, our easy-to-use ID & Print feature provides you with a secure printing environment. After sending a document from your PC to the bizhub, simply touch the bizhub with your finger or IC card to automatically begin printing – there’s no need to enter a password. If you choose, you can also use the ID & Print feature without the biometric unit or IC cards by entering your password directly on the control panel. By copying or printing documents with a special security pattern, C652/C552/C452/C652DS’s Copy Guard prevents unauthorised copies from being made on the C652/C552/C452/C652DS. The Password Copy feature allows this protection to be cancelled by entering a password before attempting to re-copy the document. The new bizhub now comes with a client module supporting the IEEE 802.1X authentication standard. This enables you to connect to secure networks, effectively shutting off all communication from unauthorised clients, and only allowing authorised users to connect. The Web-based PageScope Enterprise Suite provides you with solutions to empower your MFP as well as your business by offering centralised management of accounting, authentication and device information. The suite includes Account Manager, Authentication Manager, My Panel Manager and Net Care Device Manager, and systematically links applications, integrating and sharing them seamlessly on one server. This results in much easier operation and better-integrated management. These products comply with the security requirements of ISO15408 (EAL Level 3). The new bizhub employs a new MFP Controller – the heart of the MFP – and a new image ASIC (application-specific integrated circuit). Due to these new technologies, overall image quality is markedly improved. 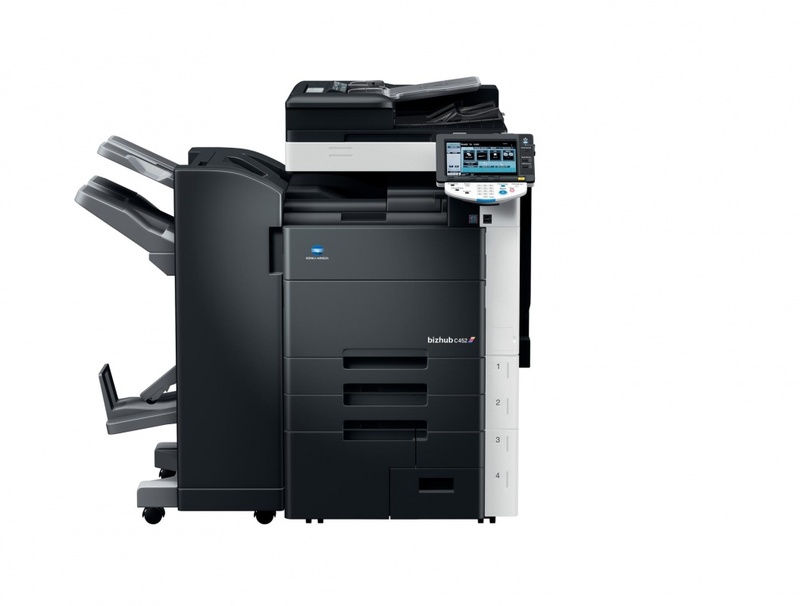 The new bizhub enhances productivity with high-speed printing, copying and scanning, as well as significantly reduced product downtime. To start with, the machine’s warm-up time has been greatly decreased*. The new bizhub also boasts one of the fastest first copy times on the market. Furthermore, these machines can promptly handle multiple jobs simultaneously such as fax and scan, scan and print, and print and save to Box. 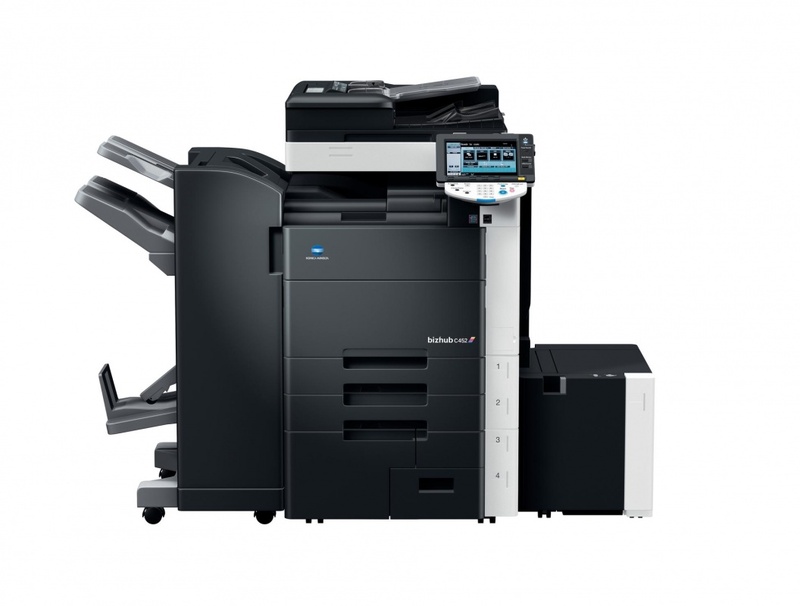 The C452 also has a sheet-through high-speed duplex Automatic Document Feeder (ADF) allowing colour document to be scanned at the same high speed as black & whites, and large volumes of documents to be converted into electronic data. The ADF can also handle postcard-size paper, and scan thick and thin paper (35 to 210g/m2) at the same speed as plain paper. Scan Productivity (300dpi, A4 Crosswise) *Max. Konica Minolta’s proprietary Emperon printer controller boasts a host of new features, functions and compatibilities designed to increase print performance, making it our best Emperon ever. • Black Over Print* This new feature helps ensure that areas meant to be in black are not inaccurately rendered in white – a potential problem when printing black on colours during 4-colour printing. • Auto-Trapping* In Auto-Trapping Mode, the white borders between colours are printed using an optimal colour from surrounding colours, eliminating incorrect registration. • PPML-Variable Data Printing (VDP)* The new bizhub now supports PPML (Personalised Print Markup Language), a technology designed for high-speed variable printing output. • Support for PDF 1.7 The new bizhub supports the PDF 1.7 version. This enhanced PDF version offers more interactive printing, security and CMM (Colour Management Module) features. 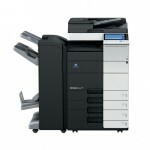 The new bizhub holds up to 3,650 sheets of paper. 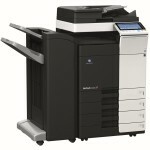 With the optional Side Paper Deck LU-301, the bizhub’s capacity increases to 6,650 sheets! 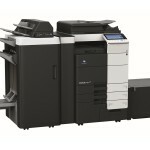 The bizhub handles a wide range of paper size from A6 to A3 wide, with our new, optional, large-capacity LU-204 also boasting an impressive A3 wide capacity. Finally, the bizhub also accommodates thick paper up to 256g/m2 in all but its multiple bypass tray, where it handles paper as thick as 300g/m2. Create professional presentations, attractive manuals, proposals, banners1 and even direct mail without ordering through a printer. Get print-on-demand versatility by combining the C652/C552/C652DS with the optional FS-526 finisher, or the C652/C552/C452/C652DS with the optional FS-527 finisher. These high performance finishers feature automatic stapling, hole punching2, 3, saddle stitching4, 5, Z-folding6 and many other finishing tasks, allowing you to take on both large and small-volume jobs in-house. 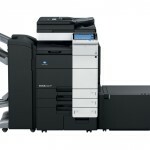 1 C652/C552/C452/C652DS: Optional Banner Paper Setting Guide MK-715 is required. 2 FS-526: Optional Punch Kit PK-516 or Z-Folding Unit ZU-606 is required. 3 FS-527: Optional Punch Kit PK-517 is required. 4 FS-526: Optional Saddle Stitcher SD-508 is required. 5 FS-527: Optional Saddle Stitcher SD-509 is required. 6 FS-526: Optional Z-Folding Unit ZU-606 is required.